Steelhead fishing in Michigan is very popular, with fish starting to enter the rivers in March. Runs hit their peak in April and fishing can still be good up until the end of May. Some of the best steelhead rivers in Michigan are the The Pere Marquette River and Big Manistee River. Both rivers offer excellent steelhead adventures. The Pere Marquette is a smaller stream, with many nice pools that hold good numbers of fish. The Big Manistee River is a larger river and is best fished with a drift boat so anglers can cover more water in search of active fish. The most common patterns that produce the majority of the trout, are egg sucking leeches, imitation egg patterns, nymphs and stoneflies. Caddis and mayfly nymphs have also been known to be effective, especially in low and clear water conditions. Early season fishing is best in the Pere Marquette River since it warms faster than the deeper Big Manistee River. Although the fishing can be exceptional on the Big Manistee, especially during the peak runs in April. Another steelhead river in Michigan is the mighty Muskegon River. This river has a very healthy run of both wild steelhead and stocked fish and the fishing can be hot, especially during the middle of April. Egg patterns, wooly buggers, nymphs and stoneflies once again are the most popular patterns used to entice these feisty fish into striking. When the water is low and clear and the fish are spooky, smaller presentations, such as beads and small nymphs are most productive. Some of the more popular fishing areas include the tailwaters of the Croton Dam, and fishing the tributaries, namely the Hersey River, Cedar Creek and Little Muskegon River. 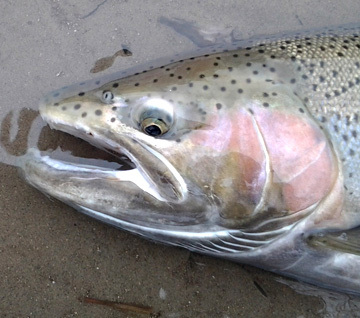 Flyfishing late into April and May, can be a great time for steelhead fishing, especially after periods of rain, since hungry spawned out drop-backs steelhead are aggressively feeding. This time of year don’t be surprised if you hook into a bonus brown trout, the colours of these spotted beauties can be breathtaking. Give steelhead fishing in Michigan a try, with so many rivers and places to fish, it’s an anglers paradise. Good luck and tightlines.